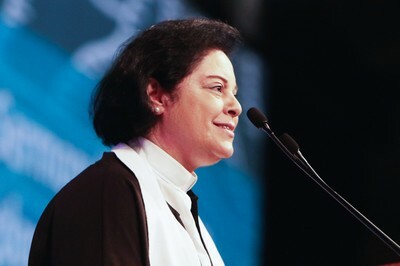 Worship yesterday morning at the PCUSA’s 223rd General Assembly was going to be especially wonderful because Najla Kassab would be our preacher. I met Najla in Lebanon last year and ever since I’ve become a shameless Fan Girl. She is extraordinary. I confess before you and God that I have an especially hard time loving Ivanka. She seems to be tone deaf in her social media presence posting professionally posed photos with her own son while other mothers’ sons are being taken out of their arms on the Mexican border. She seems to care about appearances more than true service, posting a tweet last week (which has since been removed) about the fact that the images of crying children at the border are a PR problem (but not a justice problem?) She seems to be using her proximity to power for enriching herself (coincidentally?) receiving coveted new trademarks in China just prior to her father promising to help President Xi Jinping save the Chinese telecommunications company, ZTE. 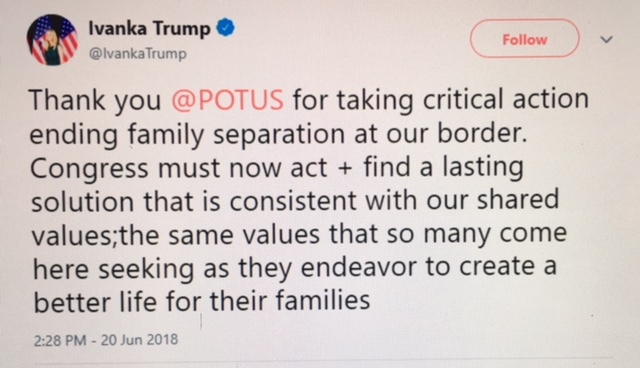 And just yesterday, she thanked her father for “taking critical action” on a crisis he himself initiated. I do not want to love her. She strikes me as being the opposite of Jesus. But I do want to be spiritually mature and whole and able to forgive as I’ve been forgiven. I cannot change her – or anyone else – but I myself can change with some potent doses of divine help. But I need to want to accept that help. Who do you have a hard/impossible time loving? Consider those people who have hurt the people you love or those who have hurt you: the bullies, the abusers, the cheaters, the thieves. And consider those who hurt the innocent in Flint and Syria and Tornillo and Yemen and Nigeria. Najla preached on the importance of seeking “moments beyond the flesh.” If we can see people – even those we deem as evil – then we can challenge them without hating them. Again – this is a profoundly difficult spiritual practice. Most days, I don’t want to love people like Ivanka. I really don’t. But I know that I need deep peace in order to do the work I’m called to do. As a Church, we are called to have the energy to do what we Presbyterians did on Tuesday. But we cannot do it well if we are incapacitated by anger towards other human beings. Anger towards evil actions or lack of action – definitely. But I for one am trying not to hate people. My two biggest prayers: Help me not be an a$$hole. And help me not to hate. Amen. Thank you for these perspectives. I’m struggling with similar thoughts about AG Sessions. Thankful that he is the problem of UMC and not PCUSA! This is just sad. To trade on someone’s fame to get someone to read your piece. To throw unsubstantiated charges against her for her lack of doing what you think she should and her father for what you think he shouldn’t do. Then to say she is opposite of Jesus and yet claim you don’t want to display what he says you must do- if you truly belong to him (Romans 8)? Yet, I see that…. She shows love and respect for her father and family. Shows herself to be a loving mother and works for the causes of women. Elegant in demeanor, choses carefully the words she speaks. To me, she strikes me as a Proverbs 31 woman of today. As far as the border crisis – Did you ever think that people are kidnapping children or taking orphans across the border ILLEGALLY because of the family loophole and they must check to see if the kids are really their? That this policy has been in place for years and not devised by Trump. I think you should focus more on Jesus and thank him and pray for Ivanka that she AND YOU will do His will. Hi Mimi. We see things differently but I’d love to pray with you/share a meal if you are ever in NC. Would love to get to know you better. Thanks as always for your perspective Jan. I struggle very much in the same way. We must continue to focus on the injustices themselves and not the people perpetrating them—very hard for me. Christ is our role model as always!